Zee, One of two aircraft companies funded by Google founder and CEO Larry Page, has been a highly mysterious business. Its web pages mostly gave discrete job descriptions for those willing to sign up for a mostly undefined mission. 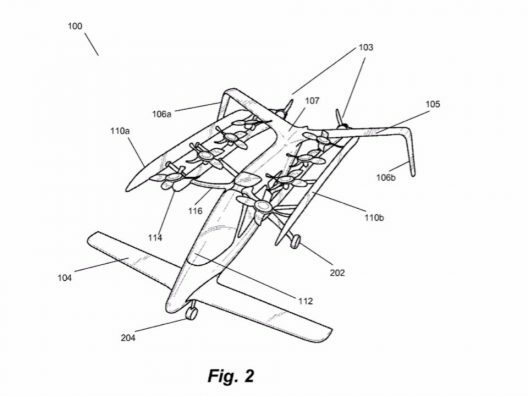 Occasional glimpses of patent drawings, spy shots of a multi-rotor craft in Google’s Mountain View, California parking lot came into view, and later, in-flight shots of other, different looking craft came from Hollister, California. 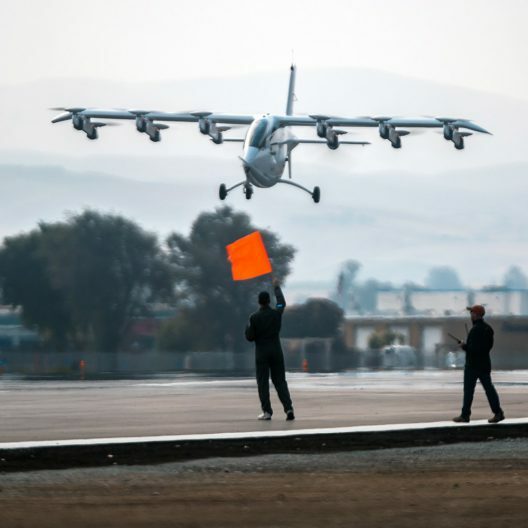 Kitty Hawk, the other company funded by Larry Page, seems to have subsumed Zee and produced a 12-rotor, single-propeller aerial taxi about the size of a Cessna 150, but capable of vertical takeoffs and landings and seamless transitions to forward flight. A white example has flown at Hollister airport and a yellow version at a field in New Zealand. The intellectual, physical and geographical journey of this craft is almost epic, and seems to have resulted in a 13-motored machine that can fly the length of a runway, hover, and alight gently. The background and changes of corporate identity are a bit daunting, and the story comes to light here. “The effort began in March 2010, originally under the leadership of Prof. Ilan Kroo of Stanford University. Patent 9,242,738 (priority date July 19, 2011) illustrates a high-mounted series of vertically mounted electric propellers similar to Z-P1. “The first vehicle, the Z-P1 Proof of Concept (POC) made its first unmanned (self-piloted) hover in Dec. 2011, and in Feb. 2014, completed its first transition. The aircraft demonstrated flights up to 60 mph (100 km/h) with vertical take-offs and landings. The manned Z-P2 aircraft made its first flight in late 2016 or early 2017; in August 2017, the Z-P2 made its first transition. Zee, the first iteration of Google’s drive to bring flight to everyone, was started by Sebastian Thrun, widely acknowledged as the father of driverless cars. With Google cars and Zee springing from Mountain View, California roots, Thrun oversaw imaginative approaches to making transportation cleaner and safer by land and by air. Ilan Kroo’s biography on Linked In gives this review of his early and ongoing efforts for what has become Cora. “Took a leave of absence from Stanford from 2010 to 2015 to start Zee.Aero. As first employee and co-founder, built a strong team of over 100 aerospace engineers to develop new concepts on personal air transportation. Returned to Stanford in 2015, but continue to spend time at Zee as Principal Scientist.” He has also designed the Swift ultralight tailless sailplane, among other accomplishments. A trip to the Hiller Aviation Museum in San Carlos, California reveals several NASA designs that are products of his fertile imagination and refined engineering skills. He has initiated and guided the different design efforts from inception in 2010 to the current two-seat prototype and apparently tested a variety of configurations. Cora has only a glancing similarity to the original patent drawings. The designers and builders have incorporated some interesting features on Cora. The 12 “lift fans” seem to be an integrated motor/propeller unit, and are set at varying angles to the horizontal. The motors are probably axial flux, but also incorporate axial cooling vanes in their perimeter. The wide fan blades seem to be molded into the top cover for each motor. Reviewing in-flight pictures of Cora and earlier test vehicles, the fans seem to have different angles in different shots, showing that they probably change position to control lateral or pitch movements of the machine. 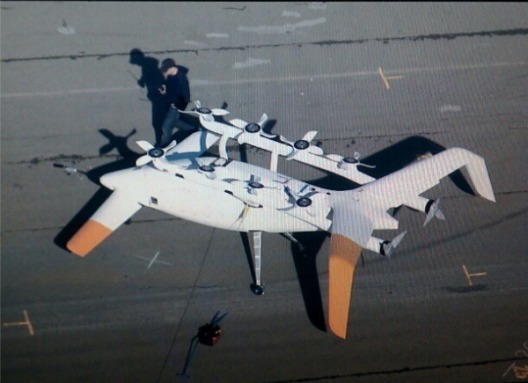 This would add a level of complexity to controls not experienced with systems like eHang’s, where the propellers maintain a constant angle to the horizontal axis of the vehicle. Cora has undergone eight years of development and seems to have a high degree of refinement. Don’t look for a Cora dealership in your neighborhood soon, though. Kitty Hawk intends this for use in on-call ride services. All you will need is a smartphone to call your ride. The video below repeats some material from the first but provides additional information on the plane’s development. 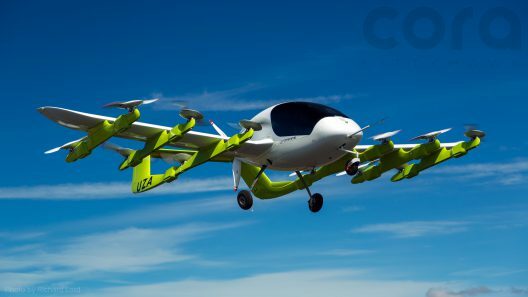 With Joby Aviation reportedly flying its autonomous vehicle around the California Coastline, eHang testing its one- and two-seat pods with its entire board of directors, Vahana hovering over the eastern Oregon plains, and Autonomous Flight making journeys along the south coast of England, several VTOL systems are openly or surreptitiously taking flight. Cora seems to be coming out from a long period of only occasional glimpses. Let’s hope that all these enterprises succeed and prosper. Next post: Forget the Airborne Pizza! Chip Yates Sends 700 Pounds!